In 1919, Theodore Pringle Loblaw and J. Milton Cork opened the first Loblaw Groceterias store modeled on a new, radically different self-serve retail concept in Toronto. By 1928, the grocer had 69 stores across Ontario. 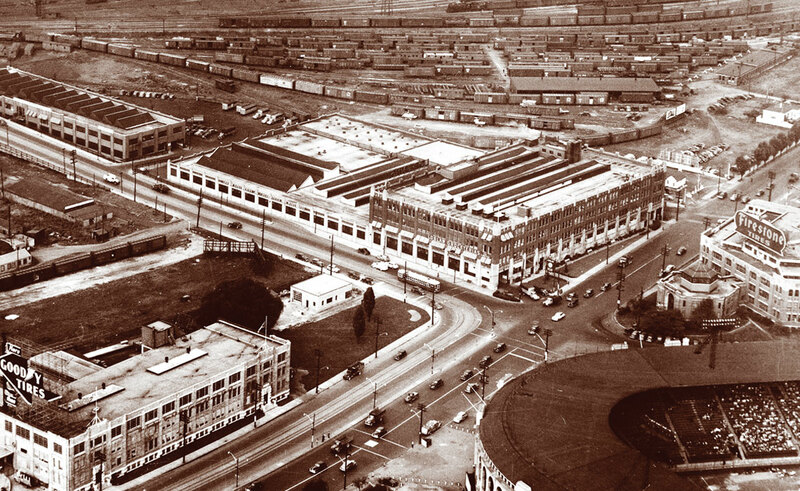 The state-of-the-art Loblaw Groceterias Warehouse & Head Office also opened in the new and mostly undeveloped lands at what is now 500 Lake Shore Blvd. W.
The chain’s co-founder, dubbed the “Merchant Prince” by the press, unexpectedly passed away in 1933 at the age of 60. By then, the number of Loblaw Groceterias’ locations had continued to grow and by 1936 had grown to over 150 stores in Canada and the United States. 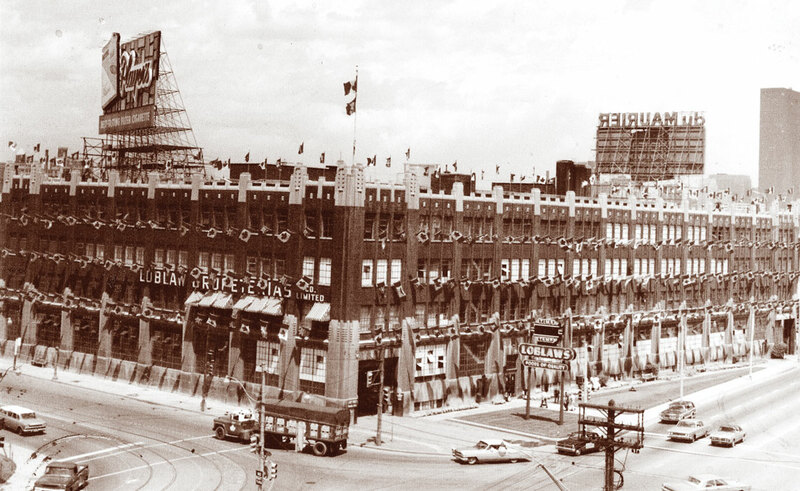 By 1939, the Loblaw Groceterias’ signs were replaced by the first “Loblaws” signs on store facades. Now, in 2016, it’s time to re-establish this historic site. Loblaw Groceterias Co. Limited Head Office & Warehouse. Loblaw Groceterias Co. Limited Head Office & Warehouse decked out with flags for the 1967 Centennial celebration. First brick preserved at West Block. Tony Grossi, President, Wittington Properties addresses the press. 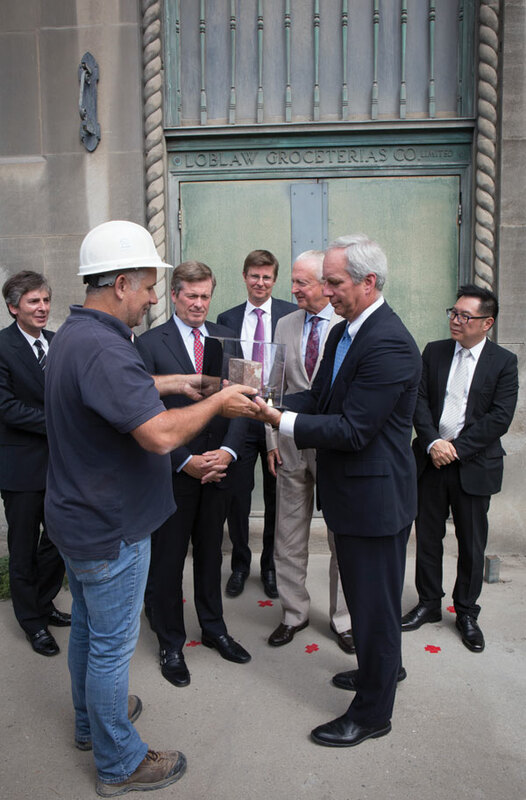 Choice Properties REIT and Wittington Properties Limited unveiled updated plans for the Loblaw Groceterias building during a ceremony honouring the preservation of the first brick taken from the building’s facade. The first brick ceremony included remarks from development partners Tony Grossi, President of Wittington Properties Limited; John Morrison, President and CEO of Choice Properties; Terry Hui, CEO of Concord Pacific Group of Companies, the parent company of Concord Adex; as well as Mayor John Tory and Councillor Joe Cressy. In his speech, John Morrison described the beginning of the restoration process, in which the building’s stones and nearly 100,000 bricks will be dismantled, labeled, stored in Port Credit, cleaned, and eventually reassembled on site. 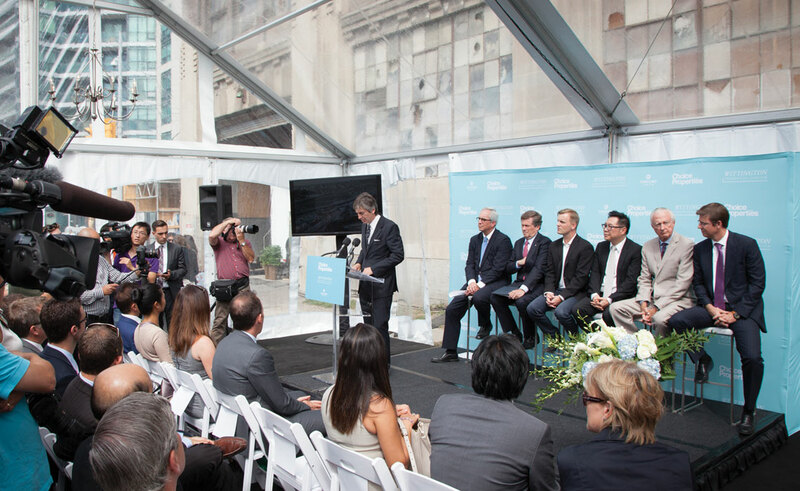 Mayor John Tory praised the mixed-use nature of the project and credited the site with welcoming visitors to the city from Billy Bishop Airport. 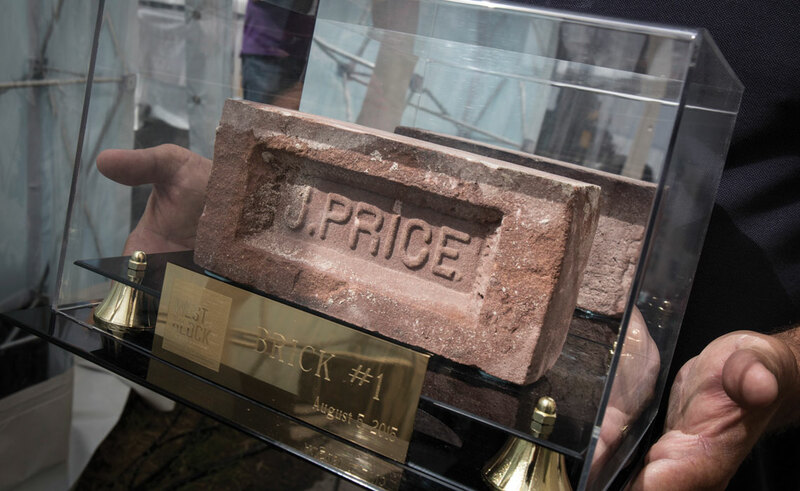 Presentation of the “First Brick” to John Morrison, President and CEO, Choice Properties. Attendees include (L to R), Tony Grossi, President, Wittington Properties, John Tory, Mayor of Toronto, Galen G. Weston, Executive Chairman and President of Loblaw Companies Limited, Galen Weston, Executive Chairman, George Weston Limited and Terry Hui, President and CEO, Concord Pacific Group. 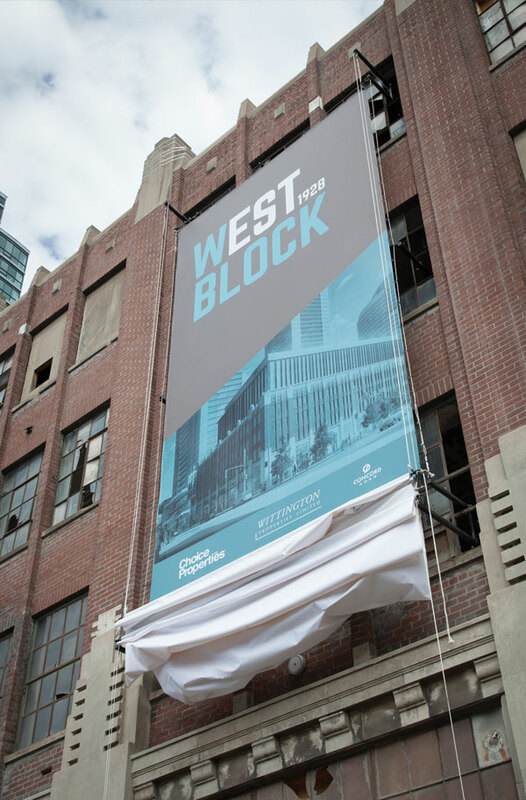 West Block development banner revealed.